Xevious is a 1983 arcade game developed by Namco and released by Atari in the US. Xevious is a top down, vertical scrolling space shooter developed by Masanobu Endo. The game was designed to run on Namco’s Galaga hardware with 3 Z80CPU’s and a Namco sound chip. It was a monster hit in Japan, but never achieved quite the same success in the US. 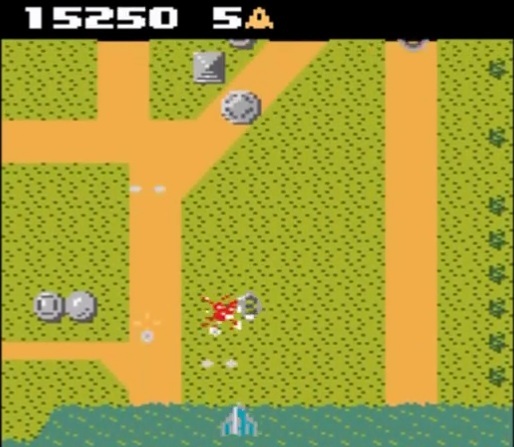 Xevious was ported to a number of game and computer systems of the era including the Atari 7800, the NES, and the Commodore 64. Versions were planned for the Atari 2600 and 5200, but never released. 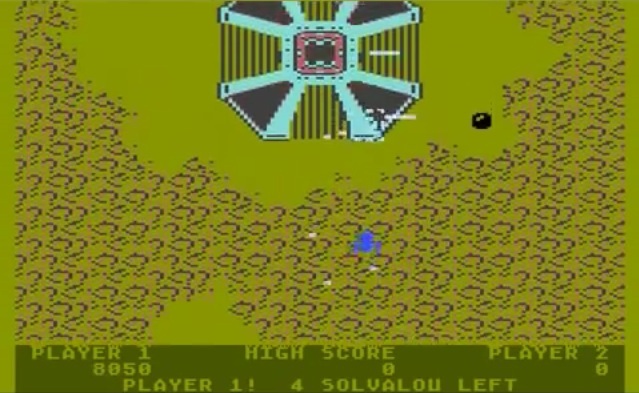 In Xevious, you must pilot your ship called a Solvalou against various enemy air and ground targets, including tanks, stationary bases, flying mirrors, and black spheres (8-balls). The Solvalou is equipped with both a zapper for air targets and a blaster for ground targets. There are sixteen areas in Xevious and the game loops back to area seven, if you are able to clear all of the areas. One of the cool things about Xevious is that if your are 70% of the way or better through an area and are ‘killed’, the game restarts at the beginning of the next area. The terrain in Xevious varies from dense forests, to rivers and oceans, to developed areas. This makes for a variety of background graphics and adds interest to the game. Another interesting thing about Xevious is that you don’t really have to ‘kill’ anything to keep advancing. If you can manage to fly your Solvalou through the game and not get ‘killed’, you can advance through the entire game without shooting anything. The 2600 version of Xevious never made it past the prototype stage. Programmed by Tod Frye of 2600 Pac-Man fame, it had the beginnings of a pretty good port. 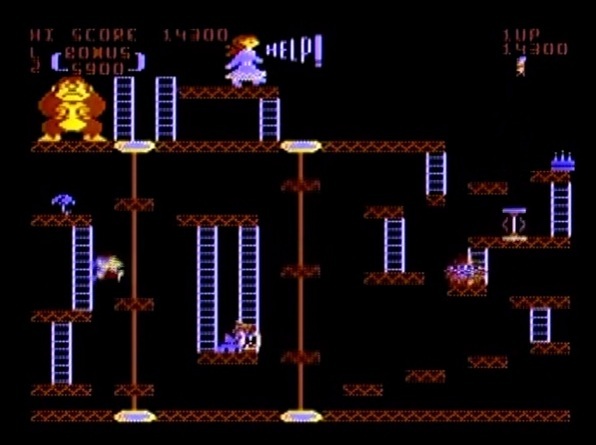 Tod was able to accomplish the scrolling background (all be it with simplified graphics) and have multiple enemies on screen, with little to no flicker. Of course the 2600 has only one fire button, so Tod had the CX-40 fire button do double duty and it fires both missiles and bombs. Tod had managed to get four types of enemies programmed (discs, mirrors, 8-balls, & tanks) into his 2600 version before the plug was pulled by Atari, during yet another management shake-up. Hopefully, one day, one of the 2600 homebrew programmers will develop a new version of Xevious. With today’s cart technology, it should be possible to develop a great version of this classic for the 2600. For more information on the 2600 version of Xevious, check out Atariprotos.com. The 5200 version of Xevious was programmed by Jim Huether in 1983, but never formally released by Atari. Happily, the final prototype version has been preserved and made available to the gaming community. It is really unfortunate that the 5200 version was never released as it is complete and it is a pretty good game. Jim managed to program almost all of the arcade’s enemies and the sound effects are nearly spot on. The two biggest complaints about the 5200 version are that the graphics seem a little ‘washed out’ and your bullets appear as ‘bars’. Other than these two complaints, Xevious is an awesome game for the 5200. It is a shame that Atari never formally released it, but thankfully, the prototype code was preserved and is playable on the Atarimax multi-cart. For more information on the 5200 version of Xevious, check out Atariprotos.com. The Atari 7800 version of Xevious is the only officially released version for the Atari home console family. 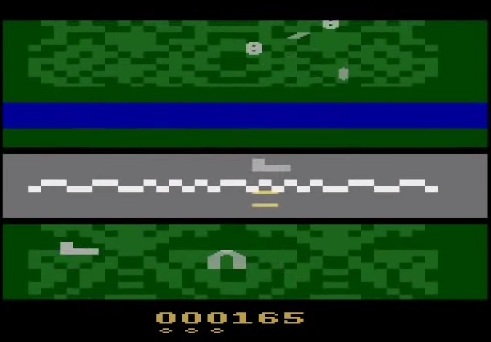 Programmed by Tom Flaherty of General Computer Corporation, it was intended to be one of the launch titles for the 7800 (had it been released as planned in 1984). Tom did an outstanding job porting Xevious to the 7800 and his version includes almost all of the enemies and features of the arcade version. The graphics are extremely well done, colorful, and crisp. Also, the sound is pretty good for a standard (non-Pokey) game. The 7800 version of Xevious can be played with either the two button Pro-line joystick or a regular CX-40. When using the Pro-line, one fire button controls the Zapper (missiles) and the other the Blaster (Bombs). When using the CX-40, both missiles and bombs are fired at the same time, like in the 2600 prototype. I had owned a copy of Xevious for nearly two years before I realized that it could be played with a standard CX-40. This is not something that Atari included in the Xevious manual, but I think it definitely makes the game more enjoyable to play! The 2600 version is clearly an unfinished prototype and is interesting, but not really anything to get worked up about. Both the 5200 and 7800 versions are excellent ports and deserve a place in your collection. While you will need the Atarimax multi-cart to play the 5200 version, the 7800 version is easy to find and normally can be had for less than five dollars. If you have a 7800 and don’t have a copy of Xevious, you should pick one up the next time you visit your local retro game shop! Categories: 2600, 5200, 7800, Atari, Game Reviews | Tags: 2600, 5200, 7800, Atari, VCS, Xevious | Permalink. There are several outstanding games in the works for the 2600. A couple of the most notable are Star Castle Arcade and Stay Frosty 2. These two games are complete and will be released as soon as enough cart boards are available for a production run. Several other homebrew games are also in the works including Circus AtariAge, Frantic, and Zippy the Porcupine. Just after I posted my last blog about Caverns of Mars, two developers (Paul Lay & Aking) converted Caverns of Mars 2 and 3 to the 5200. Caverns of Mars 2 is a side scroller very similar to Scramble and lots of fun to play on the 5200. Caverns of Mars 3 (Phobos) is very similar to the original game, but with improved graphics. If you are a C of M fan, then you should head over to AtariAge and check out these 8-bit conversions! Speaking of 8-bit conversions, Paul and Aking have converted more than dozen 8-bit games to the 5200 in the past few weeks. In addition to Caverns 2 and 3, they have converted titles such as Ant-Eater, Bacterion, and Pooyan. Thanks to Paul, Aking, and a few others, 2014 is turning out to be a banner year for the 5200! 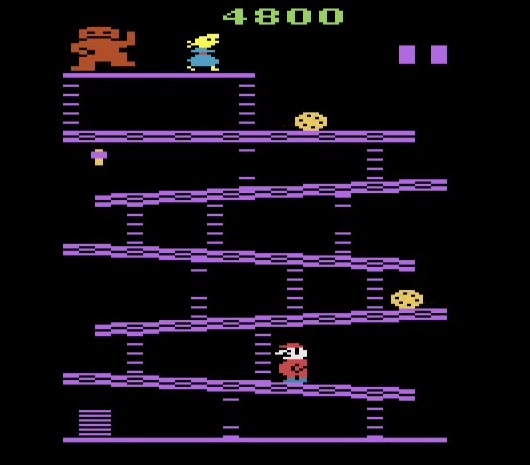 Master 7800 programmer Bob ‘Pac-Man Plus’ DeCrescenzo has recently completed Astro Blaster and is now working on a port of KC Munchkin. Bob plans to make a cart run of Astro Blaster as well as a run of ‘Bentley Bear: Crystal Quest’ in the next few weeks. 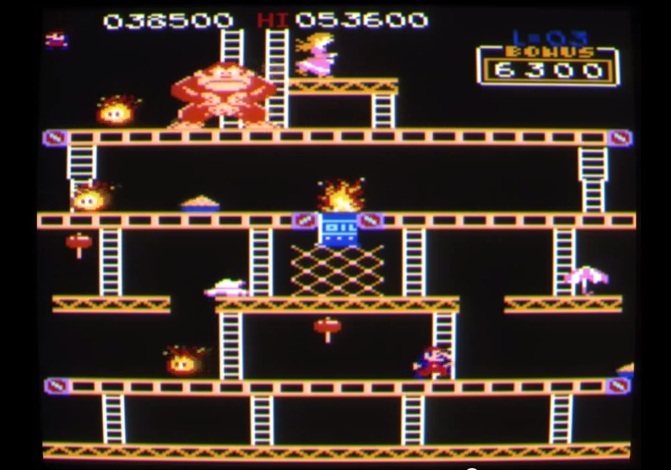 2014 may go down as the year of Donkey Kong for Atari Systems. Perry Thuente has recently completed one of the most accurate ports of Donkey Kong (Donkey Kong XM) for any home system. He spent months updating the 7800 version to be as arcade accurate as possible. His version has all four screens (only three were included originally) and Pokey sound (requiring the soon to be released 7800 expansion module (XM)). Perry has been busy assembling over 100 carts and may also release a Pokey cart version that will run without the XM. 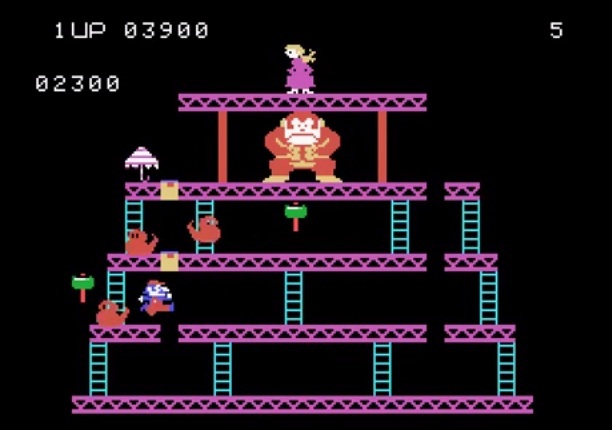 No less than two different 2600 versions of Donkey Kong (Donkey Kong Arcade and Donkey Kong VCS) are under development. Both versions are absolutely amazing and totally blow away the original version for the 2600. It is absolutely amazing to see what can be done with the venerable 2600! It is hard to believe that so many great games for the Atari 8-bit game systems are going to be available in 2014…it seems like the 2600, 5200, and 7800 will live on for many years to come! Categories: 2600, 5200, 7800, Atari | Tags: 2600, 5200, 7800, Atari, VCS | Permalink.